1. REDRED Super Stews are available in three flavours, Black Eyed Beans & Tomato, Red beans & Sweet Potato and Okra & Lentil. We tried all three and the first is our favourite! What was the process of coming up with these tasty combinations in collaboration with Zoe's Ghana Kitchen? Yes, absolutely! We see more and more people going vegan—for ethical, health and environmental reasons— and moving towards more plant-based ingredients in their diets. This year’s successful Veganuary campaign is proof of this growing trend. 3. Can you tell us what makes REDRED Super Stews so special? Unlike other kettle-to-lunch concoctions, REDRED is vegan and gluten free, made using nothing but plant-based ingredients– think okra, lentils, red beans and sweet potato, to name a few – made all the more mouthwatering with a combination of bold herbs and spices. Every pot clocks in at under 300 calories. 4. The visuals from the graphic imagery to the video campaign are on point! Who are the creatives behind the art? The illustration style is courtesy of Nigerian artist Dennis Osadebe, best known for his contemporary, vibrant post-pop style; while London-based designer and up-cycling maestro Yinka Ilori designed furniture for the REDRED pop-up. 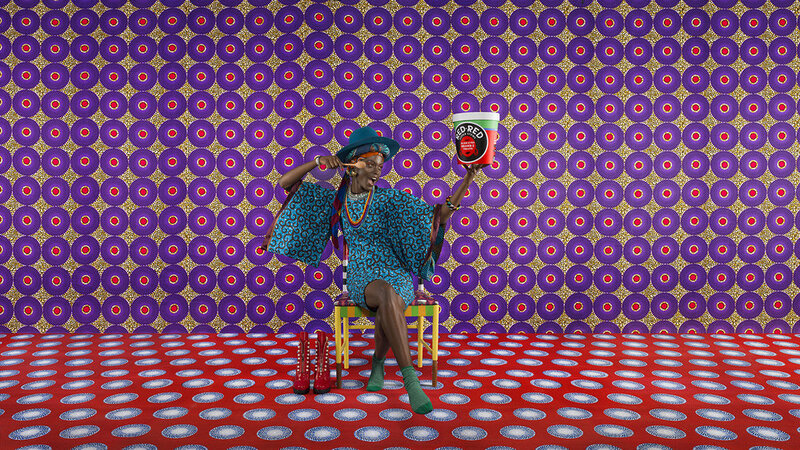 Among our other collaborators are photographer Patrice De Villiers, of Inglorious Fruits & Vegetables campaign and fashion designer and creative entrepreneur Samson Soboye, who worked on REDRED photographic imagery to make it just as intense as REDRED‘s flavours. We are also working with Swakara Atwell-Bennet founder of online BetterShared, a platform celebrating creative of the African diaspora. 5. Have any pots reached Africa yet and if so what has the response been? Not yet, apart from a few pots who have travelled through Tanzania with our Farm Africa partners. 6. Twelve pence from every pot sold goes to Farm Africa, tell us more about this? Our vision is for REDRED to be a force for good supporting Africa. We’re partnering with Farm Africa, an NGO that supports sustainable agriculture programs in eastern Africa, and donating 12p from every pot sold towards their work. 7. Congratulations on being stocked on Whole Foods! Where else can we grab a REDRED pot? You can find us in other natural and health retailers across London—Harvest N16, Alara Health Shops— as well as online–Nature’s Health Box, Shipley Health Store—and soon on Amazon and Ocado. Check out our website for our latest list of stockists 😊. 8. And finally, what's next for REDRED? More flavours, more stews, all united by a bit of spiciness; and a commitment to sharing the energy, diversity and creativity of Africa through #alunchlessordinary.